If you're a ConEdison customer, iPhone user and Mac owner in New York City and you want to dabble in HomeKit with your existing Apple hardware, you can turn your "dumb" window air conditioner into a smart device for free with an accessory and some relatively simple hacks. ConEdison customers in New York can apply for the power company's Smart AC program to receive a ThinkEco SmartAC adapter gratis. This small plug sits in between your window air conditioner and wall socket. The ThinkEco SmartAC has a built-in thermostat that measures the room's ambient temperature. 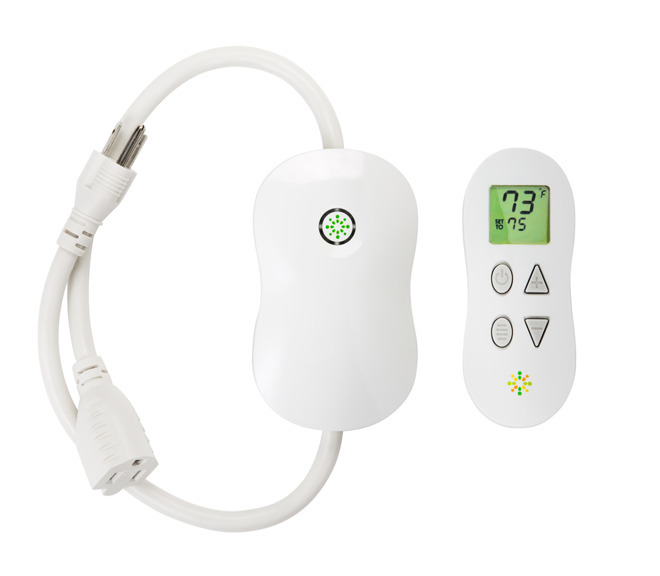 It pairs with an included remote that allows users to program their desired temperature for their room. For example, set the SmartAC to 74 degrees, and the air conditioner will run until the room reaches the desired temperature. Once it's low enough, the SmartAC will cut power to the window air conditioner, saving electricity. The free accessory takes a normally dumb appliance and makes it smart, though it works best if your window AC remembers its previous state of use once it is turned back on. The ThinkEco accessory relies on its own app and is not, on its own, HomeKit compatible. But thanks to enterprising enthusiasts who have greatly expanded the HomeKit lineup with outside accessories, it's easy to integrate the SmartAC into Apple's smart home platform. The key is Homebridge, an open-source third-party effort that allows non-HomeKit devices to still work with Apple's Home app and Siri. Previously, Homebridge was an unsanctioned project, but starting this fall with iOS 11, Apple will open up HomeKit to third-party homebrew platforms, meaning such hacks should remain functional in future versions of iOS. Homebridge is easy enough to test if you have a Mac and have some basic experience with Terminal. That said, if you haven't dabbled in Terminal before, you should probably turn back now. Still with us? You'll need to have Xcode installed, which is free on the Mac App Store, and you'll also need to install Node.js. Obviously, you'll have to enter your ThinkEco login credentials in the appropriate spaces to allow Homebridge to connect between HomeKit and the SmartAC. Next, simply type "homebridge" into Terminal to launch it. Assuming you've set it all up properly, you should be able to add Homebridge to HomeKit as a bridge, and it will include the SmartAC accessory. When ThinkEco's SmartAC is added to HomeKit, you can turn your air conditioner on or off, or adjust the target temperature for the built-in thermostat. 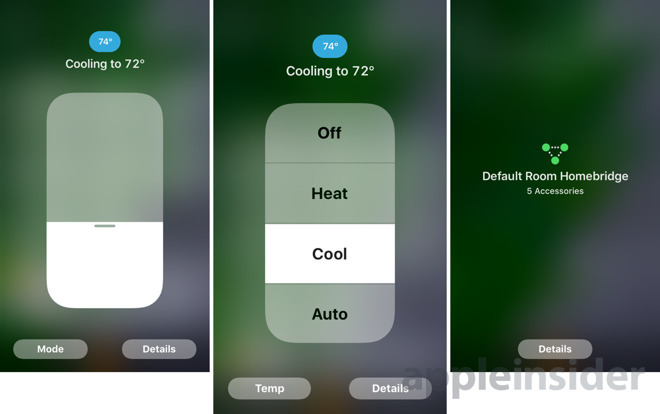 Within the Home app, firmly press or long press (depending on whether your iPhone has 3D Touch or if you are on an iPad) on the air conditioner to access temperature adjustment controls. Tap the "Mode" button in the lower left to choose between "Cool" and "Off." Options for "Heat" and "Auto" are also available, but do not apply here considering the simple on/off nature of the plug. 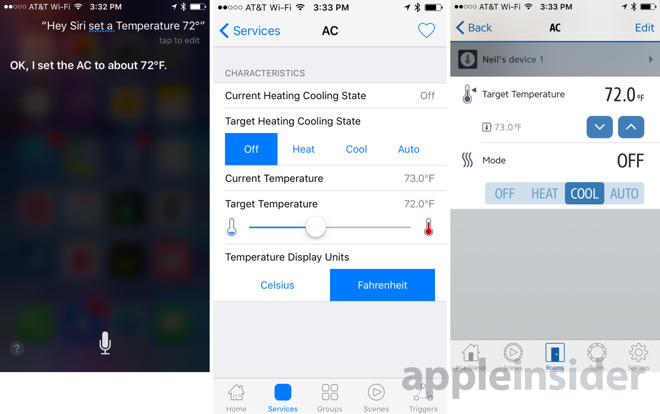 Now you can adjust the target temperature or turn the air conditioner on or off with Siri. 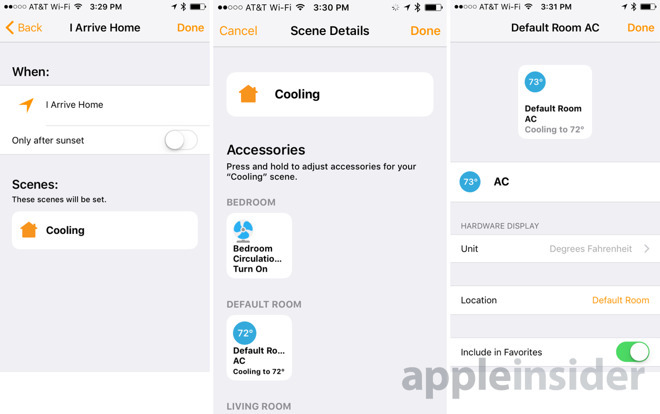 But the real fun begins when you start automating within HomeKit, allowing your window AC unit to turn on or off based on factors other than target temperature, such as temperature at a time of day, or whether or not you are home with geofencing. Unfortunately, as of iOS 10, Apple's Home app does not allow for triggers based on temperature. Thankfully, third-party HomeKit apps can create rules and automate activities, such as the Home - Smart Home Automation app for $14.99. But since this is focused on doing HomeKit on the cheap, we recommend the Elgato Eve app, which offers more granular controls than Apple's Home app. Regardless of what you use to create your scenes and triggers, the beauty of HomeKit means that you can combine your SmartAC with other HomeKit accessories, from a variety of manufacturers (even unsanctioned ones through Homebridge). Create a scene where your air conditioner and fans turn on together. Trigger your SmartAC based on a temperature sensor in another room or location. Run cooler at night and warmer in the day. You'll need to keep Terminal open on your Mac for Homebridge to continue working. If you're pleased with the result, you can buy a Raspberry Pi on the cheap and have that act as a Homebridge server, which will continue running the service without the need for your Mac to be powered on or connected to your home network.